Michael Cyger hands the show’s keys to Media Options. 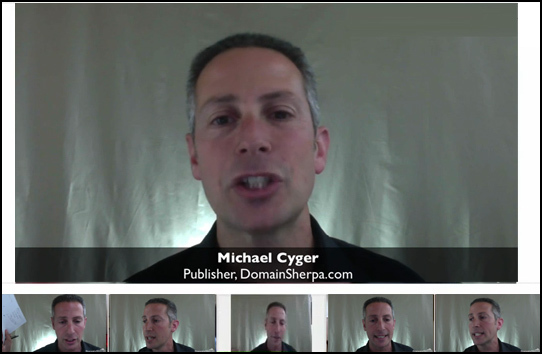 Popular industry video blog, DomainSherpa, has been acquired by Media Options, a domain brokerage powerhouse. Under the ownership of Media Options, certain things in the show’s structure will soon change. The show will be between 15 to 20 minutes long, as opposed to 90-120 minutes, to cater to viewers with ADD. The Media Options logo – four dots – will appear on the four corners of the screen, one dot in each corner, to signify the mother company’s endorsement. Instead of a wrinkled, back-lit drape for backdrops, a proper green screen system will be implemented, and dogs barking in the background will be a thing of the past, as the show moves in to a professionally sound-proofed studio in Panama. The new version of the show will not be called Media Sherpa or Domain Options, despite some blogs claiming so. Congratulations to Mike and Drew for this remarkable extension to the show, for years to come.